Also. I took out my original picture and used the better one given to me by PINNAZ. Thank you to the wonderful mod who saved the post! We all know this image. Little to no actual progress has been made to this cipher. Hopefully one day someone can come along and solve this. Added a better pic of the cipher. The Cipher Key is TheGiant, like how the OnlyTheCursedSurvive one was the key. Its not it, I've spended hours trying different codes. Maybe This have something to do with it. 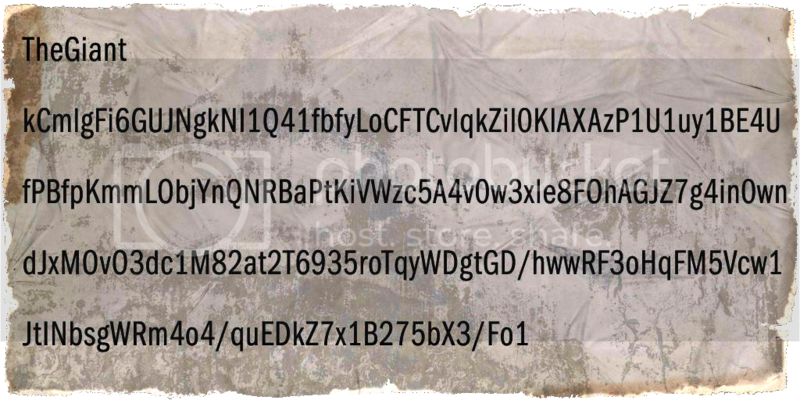 One of this might be the code, or just some random chase. But the posibilities are here. I think you will find that it is, hence it being there... Even MrRoflWaffles agrees it is, he hasn't been able to find the right thing to work it out yet though. I can imagine, just by the looks of this, that we're narrowed down to ciphers that use only key words to help decipher this code. Added, albeit I cannot prove such, I'm open to the idea that this may be multi-coded, or, in conjunction to other codes. Something tells me we're on the edge of finding it. Looks, just as well, that this is a four-word code. They've got the / symbol in there to show as such. It's a short cipher, for sure... but it's probable that it's got some good stuff in it. Then k seems most logical to stand for at the same time. + i have heard a viable theory about how you need to overload the power system so it makes sense to turn the traps on att the same time. What has any of this got to do with the cipher? For a start the double posting is off the walls, just edit the previous post and add in the new part. Second, the cipher isn't the apothicon language or what is on that gun, someone get MrRoflWaffles to explain it like he does in those lecture videos. And yes i know that my second far fetched theorie has nothing to do with the cypher. hence " I tried to make sense of whats on the gun alone"
I really hope this is figured out before the next DLC hits....lets try not to leave it up to the big wigs (although their work is appreciated!). Are we 100% that TheGiant is the key? I notice that the 3rd line about mid way through is "6935"
Could the 6 be a G? Does it work like that? Where every number or letter is the same as the next? In case that's confusing, I'm asking if the 6 is a G, does that mean every 6 is a G? Gonna just clarify some things quickly. #1: If you think that you're going to go as far as to say that there is any slight smudge of information on the side of a gun that's also in all the other modes, your perspective on Zombies and Treyarch is jaded, at best. #2: I don't even know how you got all you did from that. But it really makes no sense. #3: I went to the lengths of testing your theory out, and it is indeed a false theory. There is absolutely no real EE to The Giant, and I'll never understand why people see it that way. If there were an EE, the community would have found it months ago, with the Shadows of Evil one. #4: If you can't find something when googling it, maybe ask yourself exactly why you are googling it. You're right about most things i just disagree that there is no main easter egg on the giant..
Doesnt make sense characters are talking about it all the time. You know the original source where treyarch confirmed this? Btw the killcounter i refferenced too isn't a killcounter its default on the gun. I honestly don't think you get the idea when I say THERE IS NO MAIN EASTER EGG IN THE GIANT. If there were an actual main Easter Egg in The Giant, don't you think that the community would have found that by now, ESPECIALLY considering the fact that Der Eisendrache is nearly a week away? Added, that is a graphical glitch you're talking about. Maybe there's some small easter eggs within the map, like the damn cipher within this topic. But, the sheer inference that there is anything more than just the Fly Trap or otherwise is... beyond jaded. It's damn near insanity... and Zombies has definitely taught me that insanity isn't always what's right. Anywho, this has gotten too far out of hand, so I'm hoping this can be set aside and we can focus again on the main point of this post once more. Then what is the KN-44 inside the Summoning Key blueprint for? I know for a fact there are EEs left on the Giant, weird stuff too. Well... I figure that we will find out this kind of stuff soon enough. Right now, however, I'm mainly just wanting to wait and see exactly what happens, and will most likely question its significance after it is released. Can a mod or @JustSavage05 add this to the OP. We need this solved ASAP! Random Idea that may lead nowhere, but Icarus can be seen on the map and Richtofen has those 2 vials of blood from MotD on him... Has anyone tried using the labels as a key? DISCLAIMER: I know exactly jack about decoding cyphers or if my idea would even work. It's something that I cannot find a answer to. I've done some research on what it could be. I only have my phone right now instead of a PC so I'm limited to what I'm able to do. If you enter the first part of the cipher, kCmlgFi6GUJNgkNl1, into a cryptogram solver the words TUSCANY ADRIATIC come out. Tuscany is very close to the Adriatic sea so it kind of makes sense. Maybe these are the first two words to the cipher? Can these letters be used to solve the rest of it? The bolded terms are the ones that differ between the two of us. Y=you, M=me. I also noted a few other discrepancies between us. One of them is that you put the letter O instead of the number 0. I think they can go either way, but the main point is that it is the same throughout. The other one is that I consistently used lowercase "L" for the " l " instead of uppercase "i". Once again, I think this character is identical throughout the cipher, but you should stick to just one. You have both capital "i" and lowercase "L". I personally don't see where you could have made that distinction.